The Taurus SPECTRUM is the first semi-automatic pistol equipped with soft-touch panels seamlessly integrated into the grip and slide. Its breakthrough design completely revolutionizes the concealed carry experience – delivering better comfort, better responsiveness and better control. 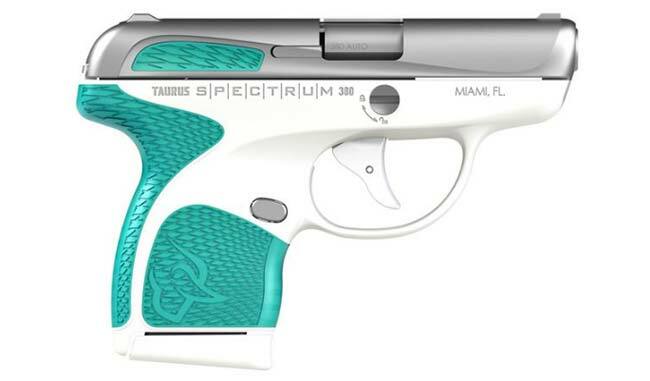 With countless color combinations to choose from, Taurus merges fashion and function for truly distinctive firearms. Any thoughts girl? Any of my regular fashionistas care to weigh in? I consider myself a menswear bro… and in that industry this is what we refer to as a “brick”.